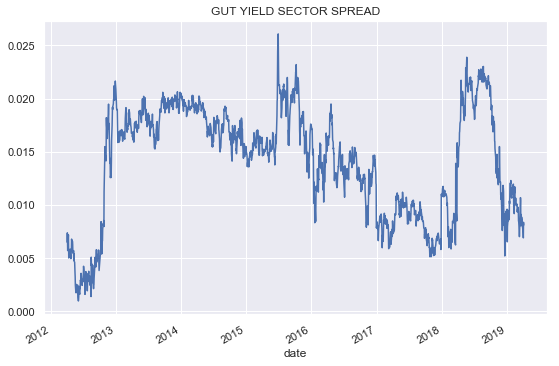 After recent distribution cuts by a number of PIMCO funds, GUT has emerged as the highest premium fund in our coverage. We find it difficult to identify the precise reason for this dubious distinction. 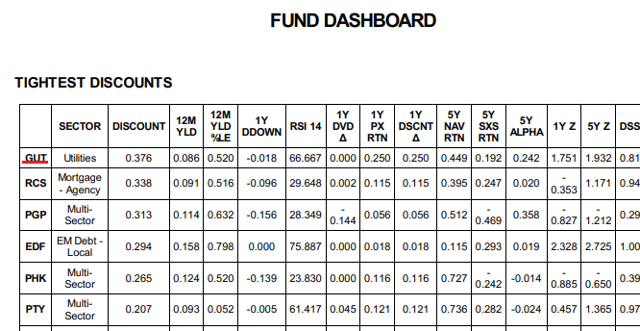 We find the fund's distribution coverage, NAV trend and baseline expense unattractive. We suggest investors rotate into any number of other funds identified in our charts and dashboard, depending on their investment criteria. One of the screens we like to keep an eye on in the closed-end fund market is the discount screen that shows the tightest and widest discounts of funds in our coverage. 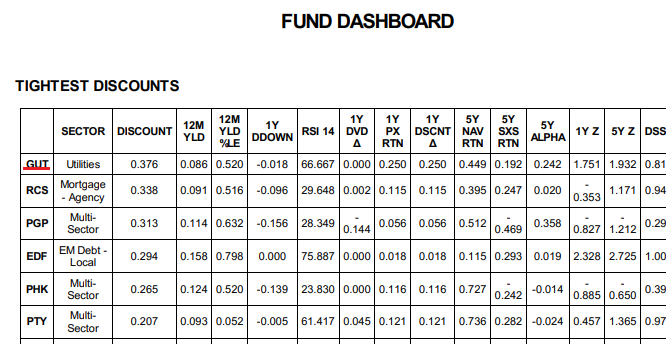 The three PIMCO funds that used to dominate the screen have now given way to the Gabelli Utility Trust (GUT). Who knew that such a staid utilities fund could have such a religious following? We find GUT a difficult fund to like. It has a high baseline expense along with a high benchmark correlation, suggesting it is an expensive tracker. It has a negative NAV trend and low distribution coverage. Its distribution rate is not significantly higher than sector average - there are other funds with a higher yield that have also increased their distributions. It also has a high empirical duration and correlation to BND, suggesting it is particularly vulnerable to interest rate rises. We think there are two basic reasons to care and worry about distribution cuts. First, many investors rely on funds to deliver a certain fixed and predictable income and a distribution cut will often throw a spanner in the works of a carefully laid-out income profile. Secondly, a distribution cut, particularly when it happens to a fund trading at a tight discount or a premium, can be painful as the market dumps the fund leading to an underperforming price and a widening discount. This one-two punch is familiar to those investors who tend to chase yield since, ironically, it is often funds with the highest distribution rates that boast poor coverage ratios and high premia which then evaporate as the fund finds it necessary to cut. 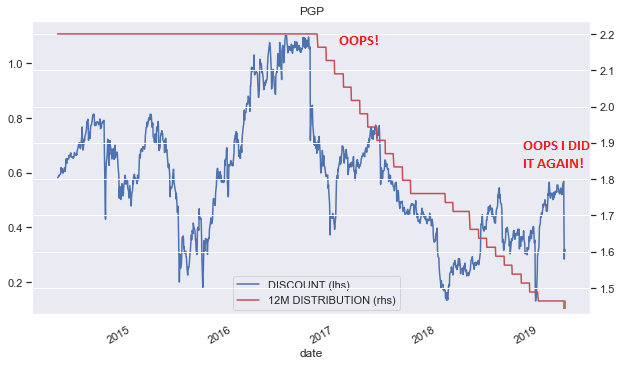 This dynamic is probably best illustrated by a fund like the PIMCO Global StocksPLUS & Income Fund (PGP) which traded up to an unbelievable premium level of over 100% in 2016 and then suffered a massive drop on a distribution cut. Its premium recovered, though not back to the lofty highs of 2016 and it cut again - suffering another fall. GUT is a $350 million CEF with a focus on the utilities sector. It has a distribution rate of about 8.6%, a leverage of 29% and a baseline expense of 1.8%. The distribution has been kept steady since about 2010. Taking a look at the broader sector performance vs. the benchmark (XLU), we wonder if it's at all embarrassing for the sector that the plain-vanilla ETF benchmark XLU has beaten all the funds over the last 5 years. You'd have to look over the last 10 years to find funds that have beaten XLU on a total return basis and even then XLU is still in the middle of the pack. GUT has not done exceptionally well - it is ranked third over the last 10 years and fourth over the last 5 years. So it is certainly not the exceptional performance that has been driving the premium. However, neither is it the distribution rate. The yield pickup of the fund relative to the sector is close to the tights of the last 7 years or so at just over 0.50%. 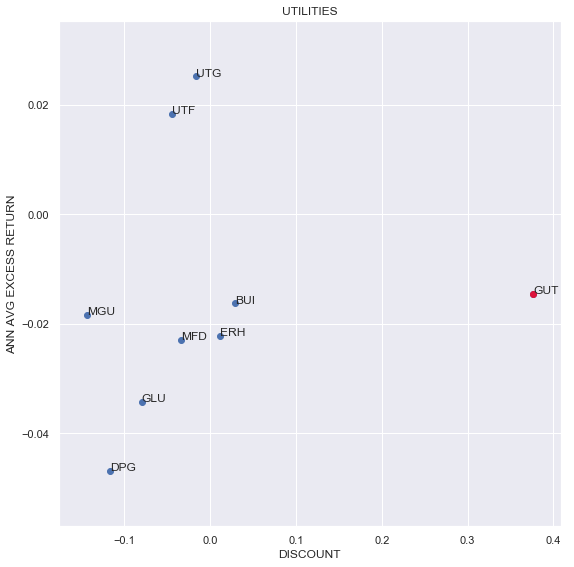 The level of premium of GUT is puzzling - normally sectors exhibit a relationship between distribution rates and discounts with higher "yielding" funds enjoying tighter discounts. 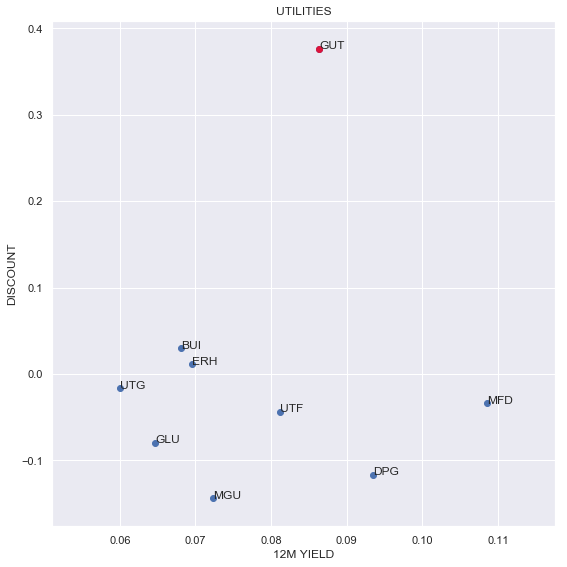 Not only does this relationship not exist for utilities but GUT is a far outlier relative to the other funds in the sector. Most of the funds in the sector have increased or kept their distributions flat - no doubt this is partly behind GUT keeping its distribution stable as well. 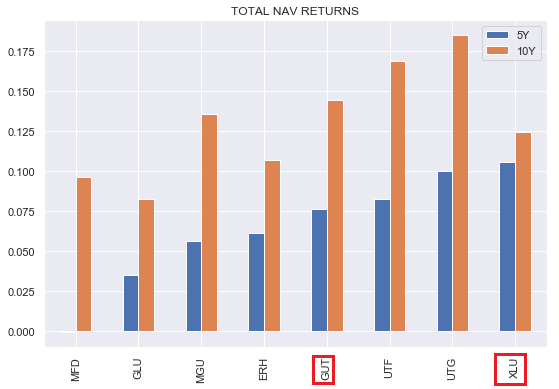 There are three funds in the sector that have not only increased their distributions but also outperformed GUT in NAV terms over the last few years in the top right quadrant. 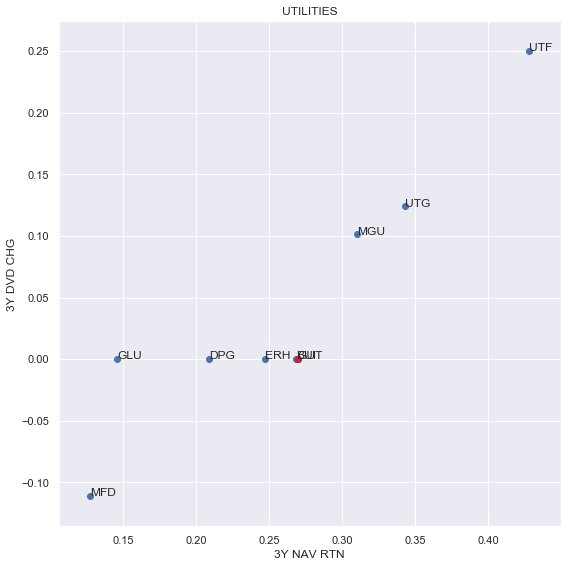 The sector also does not appear to differentiate among funds that have under and over-performed it, rewarding GUT with an unusually high premium while ignoring the outperformers in the top left quadrant. 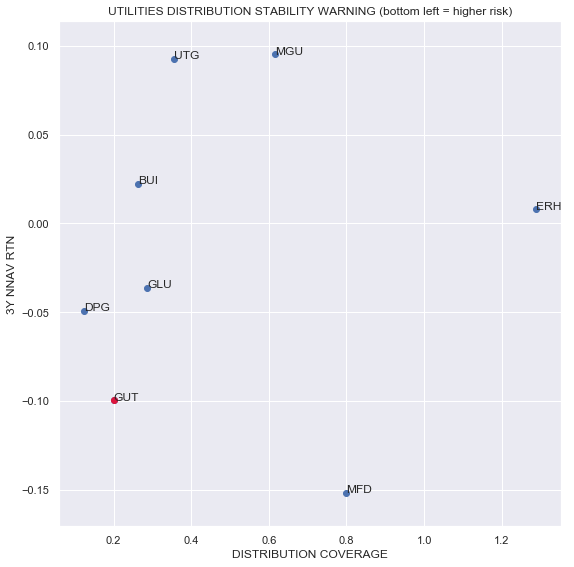 Checking in on the distribution stability screen, GUT is located in an unfavorable lower left quadrant - having falling net NAV and low distribution coverage. Funds in this part of the chart are more likely to cut their distribution. That said, the net NAV trend has been negative pretty much since fund inception so the management may not feel much pressure to cut anytime soon. GUT has the highest empirical duration and beta to BND, suggesting it may be particularly sensitive to a rise in interest rates. After recent distribution cuts by several PIMCO funds and a sharp widening in their discounts, GUT has emerged as the highest-premium fund in our coverage - a dubious distinction. We find it difficult to identify the precise reason for the premium - the fund does not enjoy the highest yield in the sector, it has a negative NAV trend, it appears to be a benchmark tracker with a high baseline expense while underperforming the benchmark over the last five years while being particularly vulnerable to a rise in interest rates. We suggest investors consider a rotation into a number of other funds we identify in the charts above.